Dessert, serves 4, 30 mins. 1. Cut the chocolate into pieces, place it in a bowl over a pan of hot water (a bain-marie) and let it melt slowly (ensure that no drops of water get into the chocolate). Whip the cream until semi-stiff and place in the fridge. 2. Using a mixer, beat the egg yolks with half the sugar to form a light mixture. In a grease-free bowl, beat the egg whites with a mixer until stiff. While you are beating, add the rest of the sugar a bit at a time. 3. Mix the warm chocolate into the yolk mix and add the orange liqueur if used. Then slowly fold the whipped cream into the chocolate/yolk mixture. 4. Slowly fold in the beaten egg white to create a uniform, brown mousse. Divide the mousse into bowls or glasses. You can eat the chocolate mousse immediately or put the bowls in the fridge. The mousse will stiffen to give a slightly firmer structure. 5. Remove from the fridge about 20 mins before serving. 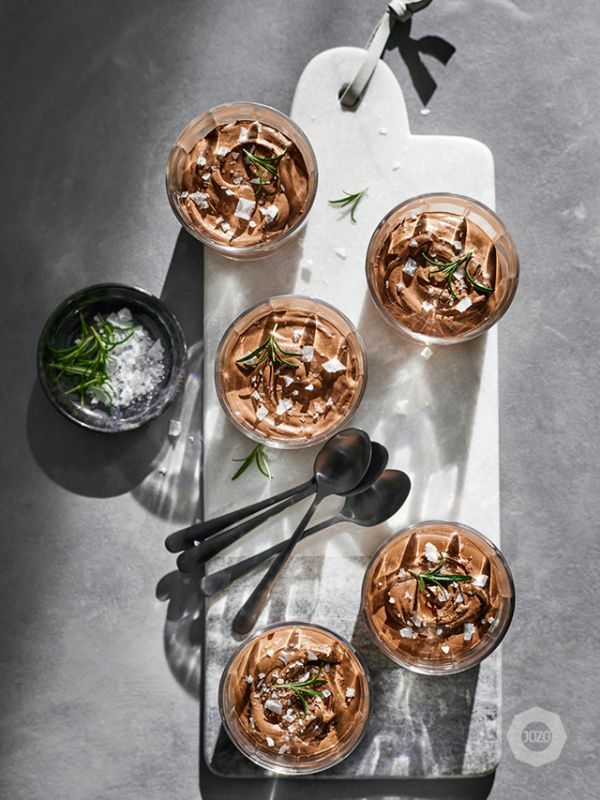 Sprinkle the mousse with JOZO 06 salt flakes and garnish with rosemary.